Introduction to Creativity and Innovation for Engineers, Pearson Education, 2017. This book provides engineering students and practitioners with neuroscience-based knowledge and methods that enable them to be much more creative and innovative as individuals and team members. Readers will strengthen their organizations, provide more effective products and services, advance their careers, and experience the thrill of doing what has never been done. After constructing a brain basics foundation, the text is organized so that the readers learn about 20 stimulating and collaborative methods to help them and their teams work smarter – more effective, efficient, creative, and innovative. Each item in this cognitive toolkit is described, with examples, followed by discussion of the method’s neuroscience basis and its positive and negative features. Readers are shown how to mix and match these tools just as they would with software tools at their desk or hand tools in a workshop. The book also identifies the innate, often under-utilized characteristics of creative-innovative individuals. The text presents 90 highly varied examples of creative-innovative results from within and outside of engineering. They include systems, facilities, structures, products, and processes along with their benefits. The descriptions suggest the broad application of a creative-innovative mindset and the resulting benefits in both the technical (e.g., research, analysis, planning, design, manufacturing, construction, operations) and non-technical (e.g., finance, marketing, human resources, management, leadership) aspects of engineering. Studying these examples, which appear throughout the book, stimulates the reader because they show the value of personal characteristics such as empathy, studiousness, experimentation, and persistence. The examples also illustrate ways to overcome the resistance to change typically encountered when bold new ideas are offered and demonstrate the potential positive impacts of the creative-innovative process. 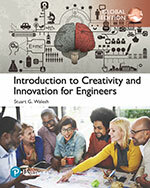 Introduction to Creativity and Innovation for Engineers should be read by most engineering students and young practitioners because it opens a window to topics not usually included in their formal education. The author realizes that some practitioners will view this book as being academic, theoretical, ivory tower, touchy-feely, and philosophical. He has received such reactions. The book is 180 degrees from that. This is practical “stuff” that capitalizes on the combination of what we have learned in recent years about that three-pound marvel between our ears and the typical superior intelligence of engineers and similar scientific-technical professionals. Chapter 1. Why Should You Learn More About Creativity and Innovation? Faculty and students, click here for more information about the book and to order it in soft cover, as an e-Book, or in the form of one or more chapters. Practitioners and others, click here. Might you and your organization (business, government, academic, volunteer, etc.) be interested in a half-day or longer “working smarter” workshop that would draw on the book and address some of your issues, problems, and opportunities? If so, refer to a suggested workshop outline available here. I would work with you to tailor the workshop to your needs. If a workshop interests you, please contact me at 219-242-1704 or stuwalesh@comcast.net. The writing is clear with many references to the related legacy work. The first several chapters are great resources for supporting “thinking about thinking” and the idea that metacognition is indeed a key to changing a mindset. I really like the table of contents, it’s better than most, and I appreciate the exercises. Your book is a …valuable text for instilling an entrepreneurial mindset in undergraduate engineering students. -- Douglas E. Melton, Ph.D., Program Director for the Entrepreneurial Engineering Program and the Kern Entrepreneurial Engineering Network (KEEN), The Kern Family Foundation, Wisconsin, USA. Walesh lays out logical paths for taking a “whole-brain” approach. Flipping randomly to any page, the impression is not your typical how-to-engineering boilerplate. Some pages have a da Vinci-esque vibe going on. It’s a refreshing way to tackle the subjects. Stuart Walesh has done something I've thought about doing for a long time - create an innovation "textbook" that is a holistic look at what innovation is, its place in business, and how to do innovation effectively. 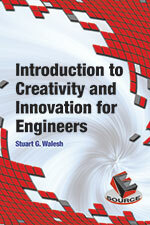 Mr. Walesh has produced an excellent textbook with a focus on innovation specifically for engineers and technologists. Walesh clearly hopes that schools and universities will adopt the book and "teach" innovation to engineers. I think this is an excellent idea, but many academic programs may not understand the value of teaching innovation methods alongside more "rigorous" engineering disciplines. That's a mistake. We need to teach young engineers calculus and thermodynamics, but we also need to teach them how to solve really interesting, difficult problems with creativity and new ways of thinking. -- Jeffrey Phillips, Vice-President Marketing, OVO Innovation, Raleigh, NC and NetCentrics, Herndon, VA.
My students and I enjoyed the book immensely. Several student groups conducted presentations based on the book. We need to teach our younger students the value of being creative and innovative. I enjoy the practical applications in the text as well as the case studies. I am planning to work some of the concepts you introduce into some leadership seminars/mini-lectures because both the appreciation and application of creativity and innovation is what will separate great leaders from average ones. -- Decker B. Hains, Ph.D., P.E., PMP, Master Specialist, Civil and Construction Engineering, Western Michigan University, Kalamazoo, MI. Walesh dives into teaching creativity from a number of angles geared to young engineers. His treatment covers why creativity is important and includes a primer on the brain. Readers learn about “whole- brain” methods of thinking, strategies for overcoming obstacles to creativity, and much more. The text is admirably designed to equip students with the tools they need to succeed. -- Ray Bert, Contributing Editor, ASCE, reviewed in Civil Engineering, April 2016. Dr. Stuart Walesh, an accomplished practitioner and educator, envisions an age of conception—one where the ability to generate feasible, surprising, and patentable concepts is a key competitive advantage. His latest book is a source of inspiration for established professionals, a textbook for aspiring engineers, and a roadmap to the future of our profession … leaders in the field should intentionally model creative behavior. With Dr. Walesh’s book in hand, that will be easier than you think. -- Jeffrey S. Russell, Ph.D., P.E., Vice Provost for Lifelong Learning, Dean of Continuing Studies, and Professor of Civil and Environmental Engineering, University of Wisconsin – Madison. This is really excellent – the first comprehensive overview of the creativity/innovation subject matter that I have read that is geared toward the engineer. The creativity/innovation topic is unfortunately overlooked at the university -- this would make an excellent textbook. The exercises at the end of the chapters are great! -- Steven D. Sanders, Ph.D., P.E., Vice-President, Burgess & Niple, Dallas, TX. This book is a celebration of engineering accomplishments and the human brain’s capacity to conceive and build them…The underlying theme permeating the book is the idea that creative thought need not be an unpredictable bolt of inspiration; it is a learnable skill that must be cultivated deliberately by engineers to successfully tackle grand challenges now and in the future. -- Ranjit S. Sahai, P.E., President, RAM Corporation, Dulles, VA. This book in not just a labor of love, and it’s not just a book of information…it’s a book that contains gold nuggets of effect, context, and consequences. It is a gift to our industry. 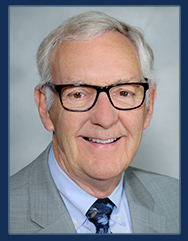 -- Dan Kelleher, P.G., President, Midwest GeoSciences Group, Carmel, IN. Engineering Your Future: The Professional Practice of Engineering - Third Edition, John Wiley and Sons and ASCE Press, 2012. Technical competency, the "hard side" of engineering and other technical professions, is necessary but not sufficient for success in business. Young engineers must also develop nontechnical or "soft-side" competencies like communication, marketing, ethics, business accounting, and law and management in order to fully realize their potential in the workplace. This updated edition of Engineering Your Future is the go-to resource on the nontechnical aspects of professional practice for engineering students and young technical professionals alike. The content is explicitly linked to current efforts in the reform of engineering education, including ABET's Engineering Criteria 2000 and ASCE's Body of Knowledge. The book treats essential nontechnical topics you'll encounter in your career, like self-management, interpersonal relationships, teamwork, project and total quality management, design, construction, manufacturing, engineering economics, organizational structures, business accounting, and much more. Features new to this revised edition include: a stronger emphasis on management and leadership; a focus on personal growth and developing relationships; expanded treatment of project management; coverage of how to develop a quality culture and ways to encourage creative and innovative thinking; a discussion of how the results of design, the root of engineering, come to fruition in constructing and manufacturing, the fruit of engineering; new information on accounting principles that can be used in your career-long financial planning; and an in-depth treatment of how engineering students and young practitioners can and should anticipate, participate in, and ultimately effect change. Engineering Your Future is essential reading for students or young practitioners at the beginning of their engineering careers because it presents topics often not included in formal education. Chapter 1. Introduction: Engineering and the Engineer. Chapter 2. Leading and Managing: Getting Your Personal House in Order. Chapter 3. Communicating to Make Things Happen. Chapter 5. Project Management: Planning, Executing, and Closing. Chapter 6. Project Management: Critical Path Method and Scope Creep. Chapter 7. Quality: What is It and How Do We Achieve It? Chapter 8. Design: To Engineer is to Create. Chapter 9. Building: Constructing and Manufacturing. Chapter 10. Basic Accounting: Tracking the Past and Planning the Future. Chapter 12. Ethics: Dealing with Dilemmas. Chapter 13. Role and Selection of Consultants. Chapter 14. Marketing: A Mutually-Beneficial Process. Chapter 15. The Future and You. Appendix A: Engineering Your Future Supports ABET Basic Level Criterion 3. Appendix B: Engineering Your Future Support ABET Program Criteria for Civil and Similarly-Named Engineering Programs. Appendix C: Engineering Your Future Supports the Civil Engineering Body of Knowledge. Click here for a description of the book; its table of contents; and ordering as a soft cover, an e-Book, or one or more chapters. ASCE members: Click here to purchase Engineering Your Future. I reference this book so often as an engineer and project manager - Stu has provided the key formulas we need for convincing clients the long term implications of "management by failure" vs. investment in "doing it right" the first time... You can find these formulas on the internet - but I bet you can't find them all in one place like this, not to mention they are the ones specifically for our trade. Lots of other great references and real world experience shared also. Argues that technical competency -- the "hard side" of engineering and other technical professions -- is necessary, but not enough. Rather, new generations must also develop "soft-side" competencies in communication, project management, accounting, marketing, ethics, law, and leadership to fulfill their potential. -- Comments in On Wisconsin Magazine - University of Wisconsin, Winter 2012. Engineering Your Future is an essential guide for students and young practitioners on the nontechnical aspects that can advance or derail an engineering career...While part of the book's strength is much of the advice and wisdom that applies to any vocation, its conception and execution as a work tailored to the needs of engineers make it far more valuable than most of the titles populating the "getting ahead" shelves at the bookstore. - Reviewed in Civil Engineering - ASCE, April 2012. The book is compelling and comprehensive. Professors who choose to implement your book are wise and their students more fortunate than they will initially realize...Your personal reflections were lessons in themselves to young practitioners. - Robert Boller, former high school principal. As an engineer in today’s consulting world, you are expected not only to be a technical expert but also possess business savvy…This is where Engineering Your Future will help you. It fills in the blanks from your engineering classes…For the young engineer, nothing can replace actual work experience, but why not be prepared? Give yourself a head start. Read Engineering Your Future. When your boss starts talking about a 3.0 multiplier, you will be glad you did. - Reviewed in Leadership and Management in Engineering – ASCE, June 2001. A must read for all students currently majoring in civil engineering as well as young technical professionals…[with] so many helpful tips and practical nuggets, even the experienced practitioner will benefit from reading this book. - Dr. Jeffrey S. Russell, P.E., Chair, Department of Civil and Environmental Engineering, University of Wisconsin, Madison, WI commenting on Engineering Your Future. Walesh covers all of the pertinent career-planning topics including self-management, communications, relationships with others, ethics, and leadership. - Ed Bergeron, P.E., President of H. E. Bergeron Engineers and author of A Pocket Guide to Business for Engineers and Surveyors. This “handbook” style book offers useful ideas on ways in which engineers and other technical professionals can more effectively approach the non-technical or “soft-side” aspects of working with colleagues, clients, customers, the public, and other stakeholders. Presented are 52 essays, each offering an idea or principle for professionals to improve their managing and leading knowledge and skills. Each essay is followed by pragmatic suggestions for ways to immediately apply and test the ideas and principles. Examples of managing and leading topics treated in this book are distinctions between managing and leading, goal setting and achieving, courage, asking and listening, speaking fear, presenting papers, kinesthetic learners, coaching, power of the subconscious mind, delegation, mentoring and coaching, team essentials, project planning and management, a marketing model, style, and effecting change. All consultants to management—especially those just starting their careers—can nonetheless benefit from it. 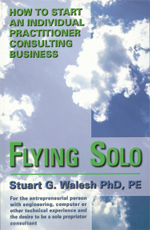 Given its title and publisher, the book appears to be directed at engineers, but everyone directly involved in business or consulting who is striving to advance within an organization will find that 90% of the lessons apply to them…the great majority [of lessons] reflect Walesh’s solid experience as a solo consultant, scholar, and academic. - Reviewed in Consulting to Management, December, 2004. If one of your New Year’s resolutions is to make yourself a more effective leader, both personally and professionally, here is a tool for you. 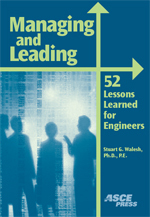 Managing and Leading: 52 Lessons Learned for Engineers is a fun and easy-to-read compilation of vignettes, each illustrating a specific point or goal and followed by practical steps for applying the ideas presented…the book is written to engineers, yet applicable to anyone. - May, 2004 review by AIArchitect, American Institute of Architects. It offers the engineer a book with a wide range of ideas, insights, and suggestions on furthering his/her career—and increasing management and leadership skills. Any engineer who is advancing in management, or who wants to improve their chances of being a leader, would be a market for this book. - Comments by Richard Weingardt, P.E. Hon.M.ASCE, CEO and Chairman, Richard Weingardt Consultants, Inc.
To learn more and to purchase, click here! This book supports my contention that basic managing and leading principles apply to various professions. That is, principles articulated for and tested by engineering students and practitioners as published in Managing and Leading: 52 Lessons Learned for Engineers were readily adapted to pharmacy students and practitioners. 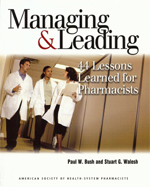 This book offers useful ideas and tools for pharmacists, residents, and students to improve their managing and leading skills, and more effectively approach the non-technical or “soft-side” aspects of working with colleagues, administrators, vendors, clients, patients, and other stakeholders. Each of the 44 lessons in this book contains an essay that offers at least one idea or principle for honing management and leadership effectiveness. Each essay is followed by practical suggestions for ways to apply the ideas using application tools and techniques such as action items, guidelines, do’s and don’ts, checklists, forms, and resource materials such as articles, books, e-newsletters, and websites. …One of the book’s strong points is that the lessons are succinct and applicable to real-life situations and are tied in with other lessons…This book is extremely user-friendly and can be utilized in a wide variety of settings…interesting quotes throughout the text…This book is unique among other managerial references in that its focus is for professional pharmacists…This book stands out from other reference books because the focus is on effective pharmacy leadership, not on being a leader based on business experience, athletic prowess, or political affiliations…I would recommend it for individuals’ self-development collection, drug information libraries, and all practitioners searching for management insights. - Review by Dr. Joseph E. Mazur, Medical University of South Carolina, Charleston, SC in The Annals of Pharmacotherapy, October 2008. To learn more and purchase, click here! Pearson, the publisher, selected this book for inclusion in its Global Edition program. This special effort aims to provide education resources to learners worldwide and does so with modest changes in content and with attractive pricing. It is available outside of North America with the highest sales in the United Kingdom, across Asia, and Australia. For a description of the book’s essential features, refer to the first book described on this page. Faculty and students, click here for more information about the global edition book and to order. Practitioners and others, click here. Marketing: Sleazy Activity or Mutually-Beneficial Process? …this is a useful introduction for technologists who think they may want to be independent consults. - Reviewed in Consulting to Management, June, 2001. This book is out of print but may be in libraries or available used.